Nathan Slate Joseph, Son Number One , 2006, Pure Pigment on galvanized steel, 48 x 72 x 2"
Nathan Slate Joseph, Son Number Two, 2006, Pure pigment on galvanized steel, 48 x 72 x 2"
Nathan Slate Joseph, Kalahari Kalahari II , 2006, Pure pigment on galvanized steel, 72 x 24 x 2"
Nathan Slate Joseph, Ganguaur I , 2006, Pure pigment on galvanized steel, 48 x 48 x 2"
Nathan Slate Joseph, Ganguaur II , 2006, Pure pigment on galvanized steel, 48 x 48 x 2"
Nathan Slate Joseph, Arrested Memories , 2006, Pure pigment on galvanized steel, 1200 x 120 x 2"
Nathan Slate Joseph, Siam Orchid , 2005, Natural oxidation on galvanized steel, 36 x 36 x 4"
Nathan Slate Joseph, Kalahari Kalahari III , 2006, Pure pigment on galvanized steel, 117 x 24 x 23"
Nathan Slate Joseph, Samplings , 2006, Pure pigment on galvanized steel, 20 x 14 x 2"
Nathan Slate Joseph, Line Drawing Violet/Violet , 2006, Pure pigment on galvanized steel, 48 x 48 x 2"
Nathan Slate Joseph, Jaipur Teej , 2006 Pure pigment on galvanized steel, 72 x 36 x 2"
Nathan Slate Joseph, Traveling Moses , 2006, Pure pigment on galvanized steel, 66 x 28 x 22"
Nathan Slate Joseph, Small Space , 2006, Pure pigment on galvanized steel, 9.5 x 18.5"
Nathan Slate Joseph, Vertical Man II , 2006, Pure pigment on galvanized steel, 40 x 15 x 2"
Nathan Slate Joseph, Vertical Man I , 2006, Pure pigment on galvanized steel, 40 x 15 x 2"
Nathan Slate Joseph, Country Squire, 2006, Pure pigment on galvanized steel, 60 x 80 x 2"
Nathan Slate Joseph, Kalahari Kalahari IV , 2006, Pure pigment on galvanized steel, 40 x 16 x 8"
Nathan Slate Joseph, Line Drawing Red/Red , 2006, Pure pigment on galvanized steel, 60 x 48 x 2"
Nathan Slate Joseph, Rujistan Earth Suite , 2006, Natural oxidation on galvanized steel, 48 x 36 x 2"
Nathan Slate Joseph, Line Drawing Yellow, 2006, Pure pigment on galvanized steel, 48 x 48 x 2"
Nathan Slate Joseph, Twin Twin Two, 2005, Pure pigment on galvanized steel, 24 x 36 x 2"
Nathan Slate Joseph, Line Drawing Earth/Earth , 2006, Natural oxidation on galvanized steel, 60 x 47 x 2"
Nathan Slate Joseph, Rajistan Red, 2006, Pure pigment on galvanized steel, 72 x 36 x 2"
Nathan Slate Joseph, Read My Life , 2006, Pure pigment on galvanized steel, 48 x 48 x 2"
October 14th, 2006-Sundaram Tagore Gallery is pleased to present "Building a Picture", Nathan Slate Joseph's exhibition of new steel and pigment reliefs and vessels. The exhibition starts November 9th and continues through the 23rd of December, with an opening reception at the gallery on November 9th from 6:30 to 8:30 pm. Nathan Slate Joseph is renowned for his signature compositions of pigmented steel plates, left out to oxidize in the elements and welded into ferrous, variegated tableaus of color. He has added a new dimension to his series of newer works shown here for the first time. They are a number of 'boats' or vessels, roughly 3 ½ feet in height, shown with their prows pointing upwards, their sinuous and rusted hulls revealed to the viewer in a way that renders the pieces as having a static aura of posterity for a journey long past, but also as a fresh testament to movement and change, and perhaps rebirth. 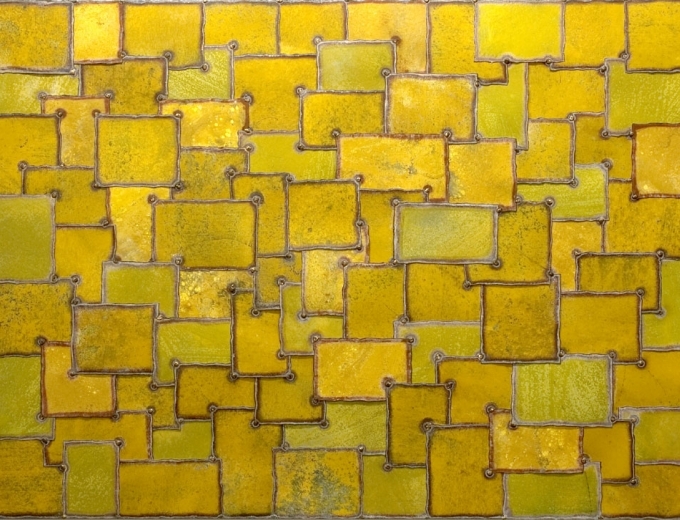 Joseph will also unveil new works from his Rajasthan series, which feature his trademark welded squares of pigmented steel, as well as a group of works from an ongoing series which display a center vertical or horizontal seam. Born in Israel to a mother from the Silk Road hub of Bukhara and a German father, Joseph was exposed to the numerous cultural aesthetics that wove richly through the region. Carpets, textiles and spices abounded in the marketplaces. Underneath the sand were remnants of Roman mosaics and architecture, left from the Roman occupation of the land centuries ago. Nathan Slate Joseph's sensitivity to change, to travel and the passage of eras can be seen in his new works, their weary grace alluding to a pregnant history. Joseph's vessels also bear witness to the shipbreakers on India's western coasts, one of the searing images of Modernity— the rusted goliaths of the modern age heeling in the white sand, men in shorts, barefoot, dotting the ship carcasses, slowly and painstakingly dismembering them to sell the steel as scrap to be recycled. In Joseph's many travels to India, a connection has been made- about the understanding of cycles, of the ability of time to reduce all things to dust, and to renew them as well.